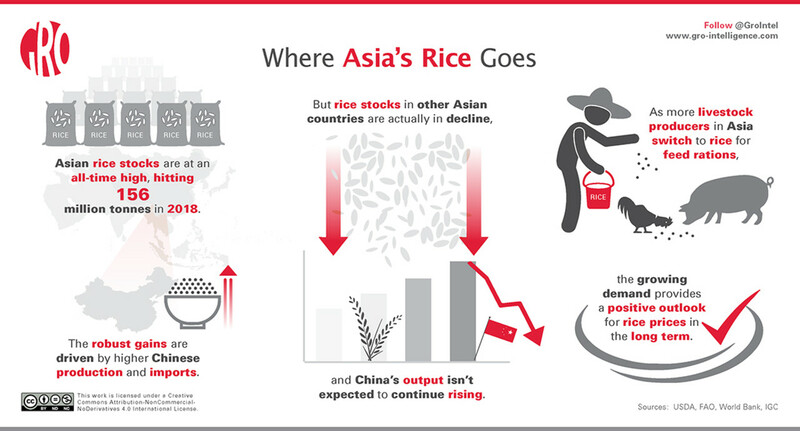 Asian rice stocks are at an all-time high, but recent trends are beginning to chip away at the region’s rice glut. 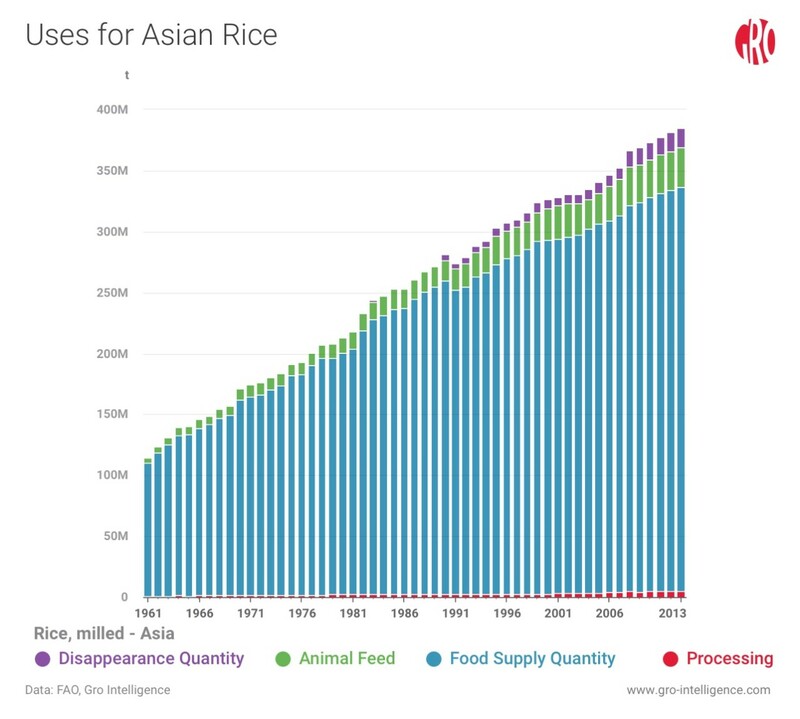 Total Asian rice inventories, which account for 95 percent of worldwide rice stocks, rose to 156 million tonnes in 2018, beating out the previous record of 150 million tonnes from the previous year, according to estimates from the USDA’s PS&D database. 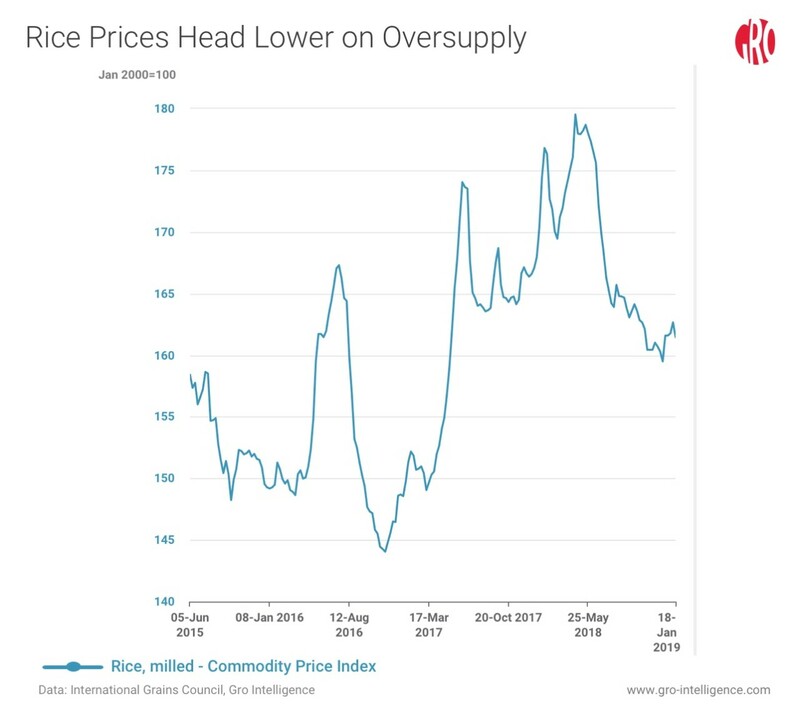 The effect on prices has been pronounced, as the International Grain Council’s global rice price index is currently hovering around an 18-month low. 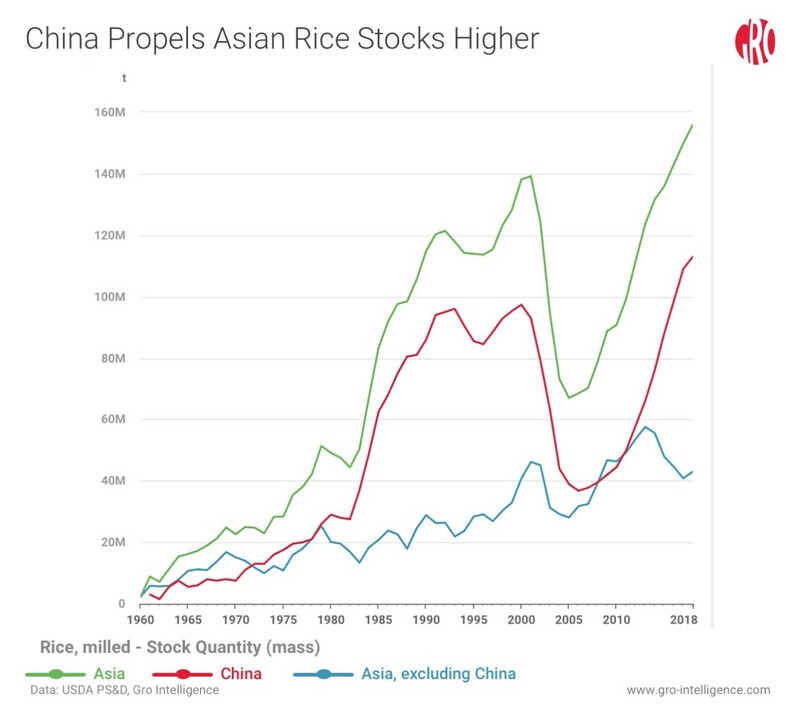 But the region’s sharp increase in stocks has been entirely driven by China; in contrast, rice inventories in Asian countries excluding China have actually fallen by 25 percent in the past five years. Historically, Asian governments, such as those in Thailand, Japan, and South Korea, have supported local farmers by purchasing domestic production, resulting in a substantial buildup of government stocks. In recent years, however, those stocks have been diverted to satisfy new domestic uses and exports to China. In this Weekly Insight, we assess the impact of some recent trends affecting Asia’s rice sector. On the supply side, China’s recent agricultural policies are likely to curb production growth in the country’s rice fields. Rice also is finding new uses around the region, particularly as feed rations for livestock, which is generating new demand. Overall, the situation provides a positive outlook for rice prices in the long term. China, the world’s largest consumer of rice, has led a sharp expansion of its strategic rice stockpile since about 2010, when the country became a net importer of the grain. As its stocks have grown, China in more recent years has begun to export some of its surplus rice, even while remaining an overall net importer. The effect on prices has been to push the global rice price index to around an 18-month low of 161.5. The index is comprised of export prices from India, Thailand, and Vietnam, and is calculated relative to a base value of 100 in January 2000. The latest reading is down 10 percent from a high of 179.5 in April 2018. 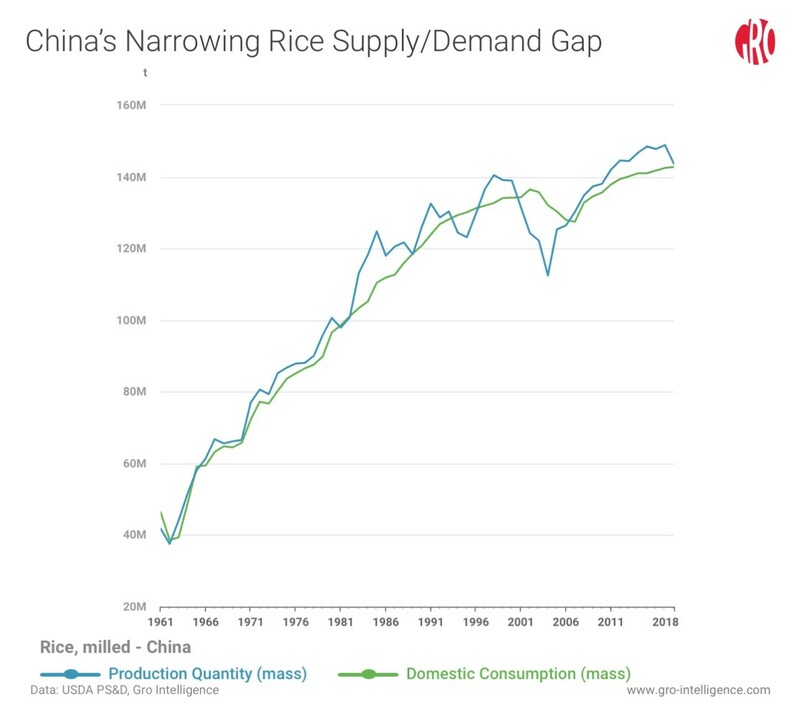 China’s rice imports have gone well beyond satisfying the country’s immediate needs, as production has exceeded or matched domestic consumption for about a decade. 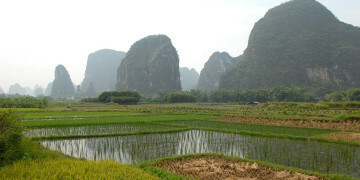 This year, however, Chinese rice production is expected to record its biggest decrease since 2003, according to the USDA. 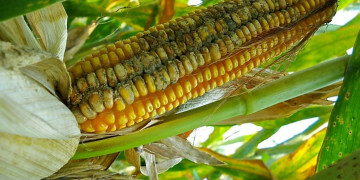 Adverse weather contributed to the declining crop. 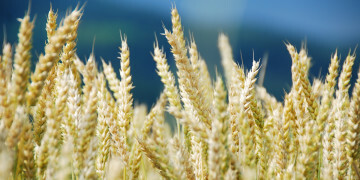 Another factor is China’s agricultural policy changes designed to put the industry on a more sustainable long-term path. The new policies, introduced in 2015, aim in part to address concerns about the environment, such as soil depletion and pollution. 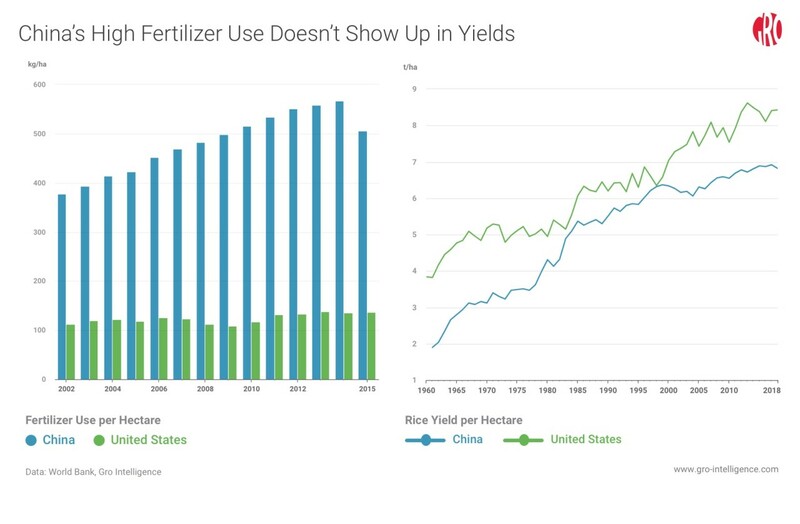 Compared with the United States, China currently uses three times as much fertilizer per hectare, but rice yields are still 20 percent lower than in the US. Continuing to increase fertilizer use would have little payoff in Chinese crop yields, but big costs in environmental degradation. Government officials have indicated that measures are planned to offset the polluting effects of heavy chemical usage. Steps also are being taken to eliminate distorted economic incentives, including reducing subsidies, price support levels, and purchase programs. The result is expected to lead to a healthier industry 50 years from now. But, in the next five years, the reforms are likely to temper yield increases and limit production growth. Low rice prices are spurring some new demand in Asian countries. A fast-growing use is as animal feed. In Japan, rice for feed use nearly tripled from 2012 to 2016 to 1.1 million tonnes as government stocks were distributed directly to the feed market. Using rice for feed has expanded steadily in Thailand, and the government has taken advantage of the demand to offload stocks of lower quality rice unfavorable for human consumption. In South Korea, rice was not sanctioned for feed use prior to 2015. Feed demand for rice has picked up since then, reaching 0.75 million tonnes in 2017. Rice makes up a small share of feed for animals, largely because its protein and carbohydrate content is inferior to that of corn, soybeans, and wheat. As of 2013, feed demand accounted for a 7.7-percent share of total Asian rice consumption, according to the UN’s Food and Agriculture Organization. More recently, a USDA research report highlighted growing feed demand from key consuming countries in the past few years, including developments in Japan, Thailand, and South Korea, as described above. Feed demand for rice, while currently narrow, can be expected to increasingly impact market prices by offsetting oversupply at the margins. In the longer term, feedlot use could become a small but steady support for global rice prices. The trend also could influence corn, soybean, and wheat markets at the margins. Despite its inferior nutrition, rice’s current market prices are competitive enough to allow rice to gain market share from other grains. Asian rice stocks have been building over several years, which has put downward pressure on prices for the staple grain. Recently, those low prices have generated greater demand for alternative uses for rice, especially in the small but fast-growing area of feed rations for livestock. In addition, China’s rising production of rice—a significant contributor to the grain glut—is expected to slow as the country moves to ease its heavy usage of chemical fertilizers and pesticides. While rice supplies in Asia can be expected to remain high for a while yet, recent trends suggest a positive outlook for rice prices in the longer term.